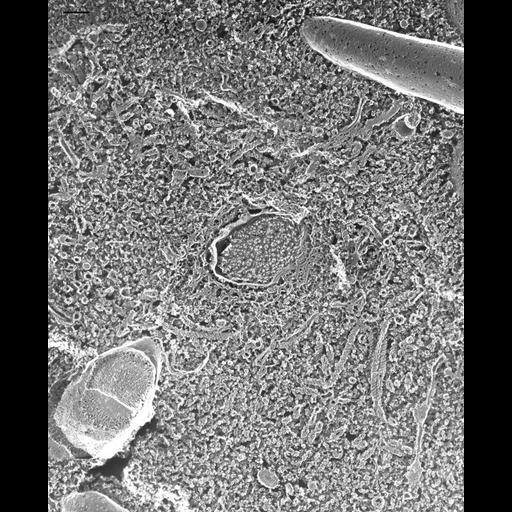 Quick-freeze deep-etch image of a fracture through the radial canal of the contractile vacuole. This technique presents a picture of a confusing array of non-etchable material surrounding a collecting canal. Lumens of smooth spongiome tubules can be observed. One gets the impression that these tubules are not entirely smooth but that they do have subunits of some sort on their cytosolic surfaces. A few segments of decorated tubules with helically wound subunits on their cytosolic surfaces are visible at the periphery of this radial arm. TEM taken on 5/26/92 by R. Allen with Zeiss 10A operating at 80kV. Neg. 19,800X. Bar = 0.2µm. A print of the negative was scanned and processed in Photoshop. This image is best used for qualitative analysis. A high resolution image (CIL:13119) is available for quantitative analysis. Additional information available at (http://www5.pbrc.hawaii.edu/allen/).